When people go to work every day, they don’t expect to come home without one of their legs. This is true even for those work at risky jobs. Unfortunately, that’s exactly what happened to a Tesla employee who didn’t take forklift safety seriously. November 18, 2016 started out as just another day at Tesla’s production plant in Freemont, CA. Then a factory worker heard a colleague scream. Rushing outside, he saw a coworker writhing on the blacktop while clutching his leg. A large pool of blood was spreading, turning the ground around him crimson red. Other workers quickly gathered around the injured employee. One tied a belt around his leg to stem the flow of blood. Help arrived quickly, but the injury was so severe the worker’s leg had to be amputated. The scene was so gruesome that Tesla offered trauma counseling to all who witnessed it. Fortunately, the injured worker survived. But losing a leg takes an emotional toll. It can also take years to adjust to. Not to mention costly medical bills, physical therapy and the cost of a prosthetic limb. OSHA requires all forklift operators to be trained and certified. The forklift was in good condition. It wasn’t even hauling a load at the time of the accident. So the #1 question is how did this tragedy happen? Sadly, it turned out to be the fault of the injured worker and another employee who choose to engage in unsafe behavior. To have fun, they were using a forklift to “do donuts” on the pavement outside the plant. The other worker lost control and slammed into his colleague. The end result was a lost leg and a life forever changed. Tesla confirmed that the accident occurred during non-work related activities. They released a statement saying the accident does not represent the firm’s commitment to safety. They also fired the worker who caused it. Forklifts are equipped with back-up buzzers and warning signals. Have drivers sound a horn when approaching entrances, doorways and sharp turns around corners. Train workers to listen for and respond to these warning signals. 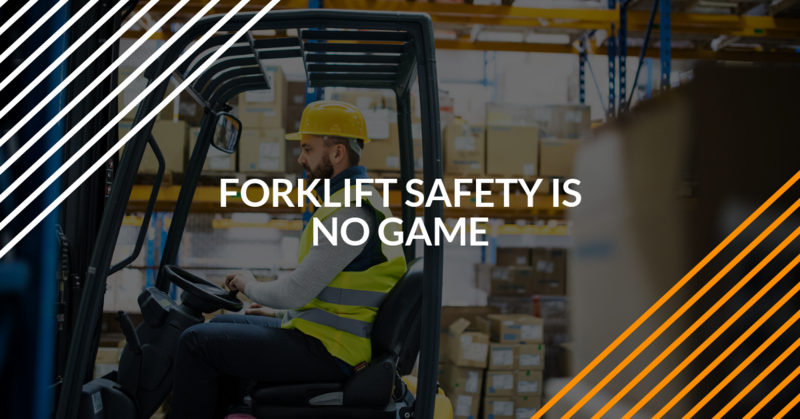 Teach employees to maintain a safe distance any time forklifts are being used. Require operators to drive slowly and safely. Have them take extra caution when working in narrow aisles or making sharp turns. Post speed limits throughout the job site. Keep the job site surface clean, clear and free of debris at all times. Make sure operators know capacity ratings for the type of forklift they use, and don’t exceed them. Check the security and stability of each load before moving it. Conduct frequent inspections of every forklift. Fix problems right away and keep up with scheduled maintenance. Never start a forklift until the driver is seated and secure with the safety belt fastened. Require operators to wear appropriate clothing and safety gear. Never operate a forklift with greasy hands. Use extreme caution when operating a forklift near the edge of a dock or loading ramp. Always check for overhead objects before lifting or stacking a load. Use a lookout to assist the driver when visibility is poor. The best way to reduce accidents is to see that everyone follows OSHA safety guidelines. OSHA requires all companies that use forklifts to implement a training program. This program should be based on the basic principles of truck safety and the type of forklift being used. It should also take into account all forklift hazards at the work site, and the safety procedures to avoid them. Training may sound like a lot of work, but it’s required by OSHA. Safety violations can result in large fines and bad public relations. Training is a must for maintaining a safe work site. It can also prevent the cost of repairing or replacing damaged trucks. Training and certification don’t take as much time or cost as much as you might think. In fact, at forkliftcertification.com, you can get your team OSHA trained and certified in less than half a day. The training includes step-by-step learning and interactive lessons. Workers can take the training during their lunch hour or at home. And the training meets all OSHA requirements. Call us today at 888.278.8896.